Benign: Organisms that live in or on people and are neither harmful nor recognized by their bodies. They’re present, living happily, and our bodies essentially ignore them most of the time. Friendly: Organisms that live in or on people and are not harmful. Their bodies recognize that the organisms are present and also recognize that these bacteria are not harmful, so their bodies don’t react to them. Mutually beneficial: Organisms that live in or on people and provide a benefit, like making vitamins that they can’t make themselves. 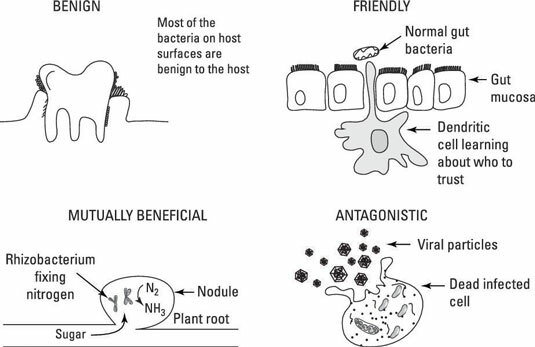 The hosts, in turn, provide the organisms with benefits, such as nutrients and a home. Antagonistic: Organisms that cause harm, as in the case of viruses where the cells are taken over to produce more virus and are eventually killed. Research is still being done to determine to what extent the human body’s immune system recognizes and reacts to the friendly, nonharmful bacteria that live in and on people. For every living organism on the planet, there is a microbial pathogen (a disease-causing organism) perfectly suited to plague it. Some microbes are nasty pathogens that infect their host, subvert their defenses, and wreak havoc in the form of severe illness and sometimes death. Other microbes produce toxins that cause nasty effects on their target. These include microbes that infect animals, plants, insects, invertebrates, and so on. There are even microbes that infect other microbes. On the other hand, there are accidental infections that result when a person with a compromised immune system comes into contact with a microorganism that is common in the environment but can survive in the warm, moist habitat of the human body. These include yeasts, fungi, and bacteria such as species of Bacillus, the pseudomonads, Acinetobacter, and Clostridium. Pathogenic microorganisms have even been found to have shaped their hosts’ evolution. A chilling example of this was recently discovered by looking for the effects of the plague of the Middle Ages on the evolution of people in Western Europe. Researchers found that genes for immunity were different in people whose ancestors had been exposed to the bacterial pathogen than in those whose ancestors weren’t. They also found that genes related to autoimmune disorders were affected, suggesting that a pathogen can have a profound impact on its host’s evolution.